Free shipping. Product listing ads. Pay-per-click advertisements. 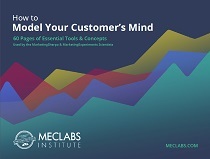 There are many tactics marketers can invest in to acquire customers, and they all have some form of cost. How much should it cost to acquire a customer? There is no single correct answer. However, in this MarketingSherpa Chart of the Week, we'll take a look at your peers' overall trends to give you a rough idea of where acquisition costs are trending. One of the metrics we asked about was acquisition cost per customer, not only for the monetary value, but also if that cost was rising, steady or falling. You can see the resulting data below. Marketers often ask about metrics like average acquisition cost, and what reasonable costs they can target, which is why we provide this information. However, first let me provide a giant caveat — the most effective cost level for your company may have nothing to do with the overall average for ecommerce sites. Having these averages helps only if you ask this essential question: Why is our cost different? So, for example, if your average cost is higher and you are selling diamond jewelry in your ecommerce store, that makes sense. It is an expensive, considered purchase where you really have to build trust with customers, so your company should have a higher cost than the general ecommerce average. You'll see that the mean (average) is very different from the median (50th percentile). 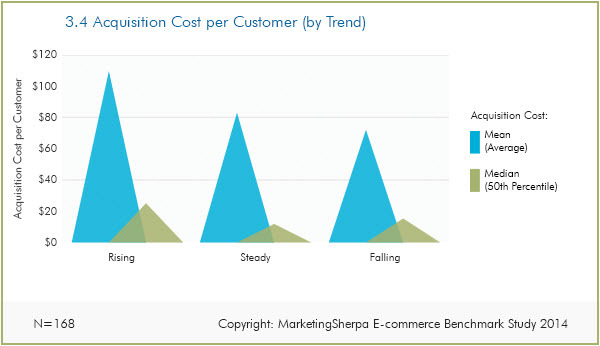 This indicates that there are some ecommerce companies with very high acquisition costs that are skewing the average. Overall, there is a divide between the companies facing rising acquisition costs and companies facing steady or falling costs — which may be due to market pressures for certain products, or simply inefficient strategies at some companies. "Pre ecommerce, we had almost total control over our marketing. Now we [feel] the effect of changing and unknown algorithms, and conflicting interests. For example, our AdWords PPC went up since we can no longer have separate campaigns for mobile and tablets. Our cause-effect ratio is slowly and steadily shifting. Since our PPC was incredibly granular it gave us an edge we no longer have as they and other sites, in their short-term best interest, continue to level the playing field. This has resulted in a steady increase in CPA over the years." For more data about how acquisition costs are changing by channel use, download your free copy of the MarketingSherpa Ecommerce Benchmark Study, made possible by a generous research grant from Magento, an eBay company. Ecommerce Research Chart: Which department owns the mobile experience?